Hosting an Eid reception for envoys at New Delhi, External Affairs Minister Sushma Swaraj said Eid-ul-Fitr too brings together people of all faiths. 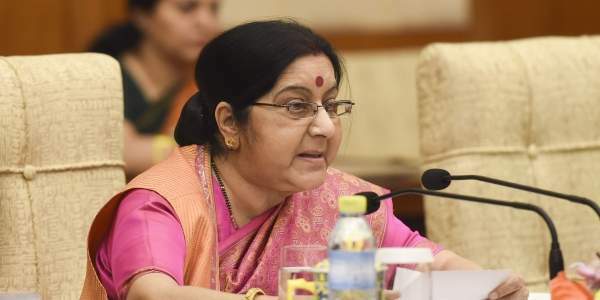 NEW DELHI: India will never allow "the forces of hatred and violence" to come anywhere near its people, External Affairs Minister Sushma Swaraj said today as she hosted an Eid reception for envoys based here. She said like any religious festival in India, whether Diwali or Christmas, Eid-ul-Fitr too brings together people of all faiths. "India is home to one of the largest population of Muslims. Our celebrations of Eid are as diverse as our regions, languages, cuisine and traditions, as vibrant as our clothes and festivities, and as sweet as our traditional meeti sevaiyan and a host of savoury dishes," she said at the reception for Ambassadors and High Commissioners based in New Delhi. "As long as we truly practice our faiths and, as the Holy Prophet himself said: 'None of you have faith until he loves for his brother, or for his neighbour, what he loves for himself. "We will never allow the forces of hatred and violence come anywhere near our peoples, and disrupt our societies," she said. Extending her Eid wishes, the minister noted that Muslims all over the world observe Ramzan as the month of fasting, with a pre-dawn meal of suhoor and ending the fast every day with iftar. It is a month to practice self discipline and self control - a test of inner strength, she said. Quoting the King of Jordan from his speech in April here, Swaraj said, "It was wisely said, the world is one family. Compassion, mercy, tolerance -- these values are shared by billions of Muslims and non-Muslims around the world." And these values require us, together, to act for our common future. "Just as His Majesty referred to one global family, we too in India have grown up believing that the world is indeed one family. The concept of Vasudaiva Kudumbakam is ingrained in our ethos," Swaraj said.